Through Petals Flowers Calgary you are able to send a huge range of premium quality flower bouquets, arrangements, roses, and more to be delivered to Calgary and Calgary�s surrounding areas. Beautiful flowers delivered by local florists to Calgary! Flowers are love's truest language. - Park Benjamin. Why not let your special friends and loved ones in Calgary know you're thinking about them today by sending them beautiful fresh flowers or a gift basket from Petals Network? We can same-day deliver to Calgary and to all major localities in Calgary... as long as you've placed your order with Petals by 2pm weekdays (for Monday to Friday deliveries) and 10.30am Saturday (for Saturday deliveries). Petals also provides a next-day delivery service to over 70 countries around the world! Your floral or gift basket delivery to Calgary is always given the highest priority by Petals... it's something that we call "The Petals Network Difference!" 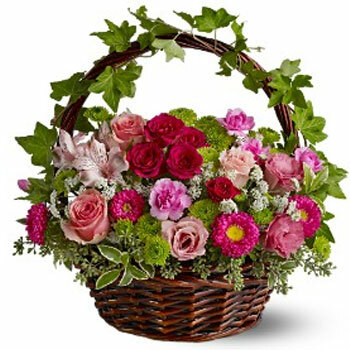 All fresh flower and gift basket orders sent through Petals Network are subject to the Petals 3-Way-Test. The 'Test' is something that we have developed as a result of our years of experience and personal contact with customers. It's only when orders pass the Petals 3-Way-Test that we know our customers will be happy, and that the orders are ready to be processed and delivered... in short, this is when we know that customers will experience 'The Petals Network Difference." By the way.... less than 1% of orders that come through Petals Network have complaints! Choose from our range of beautiful fresh bouquets, arrangements, potted plants, roses and gift baskets for delivery in Calgary ... and send your order today! To provide a light for someone's darkness at a funeral or time of grief. The loss of a friend or loved one can bring long periods of mourning. It is at this time that support needs to be shown for the ones left behind. Convey your feelings of sympathy by sending flowers to the funeral, wake... or during the lonely weeks after. Leaves should never be covered with water, as they will only make it dirty. This will decrease the longevity of the flowers! Petals Network has a network of florists in the Calgary to provide you with beautiful fresh flower delivered same day. If you want to send flowers online to the Calgary area, We will have a local Calgary florist deliver the freshest flowers available to the door! Flowers delivered to Calgary! That's what Petals can offer you. Petals florists Calgary, ALBERTA will prepare your flowers on the day of delivery so that they arrive fresh to the recipient. You will find a great range of beautiful flowers available for delivery to Calgary. We have wonderful bouquets, arrangements, seasonal flowers and even gifts and gift baskets available for deliver. Its easy to send cheap flowers to Calgary. We have flowers for all occasions at Petals Network Calgary. Petals has a network of florists in Calgary, Canada. All Petals Network florists in Calgary are qualified. Our florists will make delivery of flowers to Calgary, Canada.